People who don’t use Facebook or a smartphone are out there, but they’re getting harder to find. 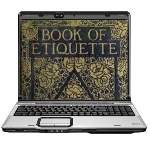 Along with the ubiquity of social networking and the mobile devices that let us check-in and share our every thoughts whenever we have them comes a new frontier that many people have yet to master: Online etiquette. One-third of survey respondents said they are more comfortable sharing information online than in person and nearly half said if they couldn’t share and receive information online via mobile devices, they wouldn’t know what’s going on with family and friends. The study also found that 85 percent of U.S. adults share information online, with one-quarter of them doing it at least once a day. Twenty three percent of people feel they are missing out when they can’t share or consume information online. Techlicious internet privacy, online etiquette, online privacy. permalink. I don’t use any Social Networks period I value my privacy. And I have no problem keeping up with family or friends. For those that want to talk we use a Team Speak or use the Phone (Land Line) not cells, though the Mrs does have one. She texts stuff on the Grandkids all the time. She also uses a Cam for those that are out of town. Why give these companys your information, just so they can make money off of it? They don’t tell you what they collect and what they sell to other companys. To me it’s a form of Theft. And they don’t give you a dime for the info either. I don’t respond to ad’s either. If i want or need something i go to the company that has it and research it a bit before i buy the product. I agree with zolar1 Get a Life and don’t give away the important parts. I personally do not have a facebook account. ALL forms of social networking cause societal problems. Too bad they won’t ban them all. People would then GET A LIFE.